Daring Bakers June 2013: Pie. Rachael from pizzarossa was our lovely June 2013 Daring Bakers’ host and she had us whipping up delicious pies in our kitchens! Cream pies, fruit pies, chocolate pies, even crack pies! There’s nothing like pie! Pie is kind of near and dear to my heart. In my early twenties I got to work and live above a pie shop that was nestled within a small, western Wisconsin town that at times would remind you of Twin Peaks or Northern Exposure. I was able to eat a good amount of pie in those days, so much that it was several years after leaving the place that I actually took to making pie at home again. I know it is said that there are cake people and there are pie people. If pressed, I'm definitely a cake person. I think mostly that is because I can make a cake with my eyes closed, even fancy layer cakes. Pie takes more time and dedication; I usually reserve it for special occasions when I want to either impress someone or show them how much I love them. I figured I'd try to knock this one last post and challenge out before the baby comes, seeing that I'll probably lay low in both the bakery and sugar departments after the new one enters the world. 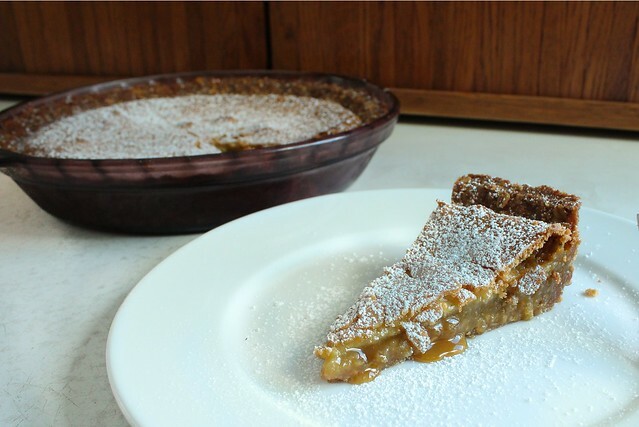 I decided to make it for Father's Day, and I chose the Momofuku Milk Bar's "Crack Pie", even though drug-referenced baked goods tend to grate on my nerves. Fortunately for me, this Crack Pie could have just as easily been named for the sound it makes when you lift a piece from the pie plate: it's gooey and caramelly (even more caramelly in my case because I used dark brown sugar instead of light), and is not unlike eating the guts from a pecanless pecan pie (which just happens to be my Husband's favorite type). 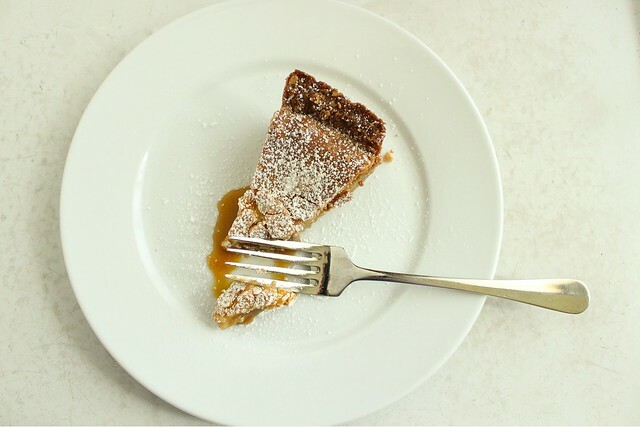 Tucked within a freshly made oatmeal cookie crust, I'm not sure a better pie could be made with pantry staples. I know this one is going to be a favorite for years to come. 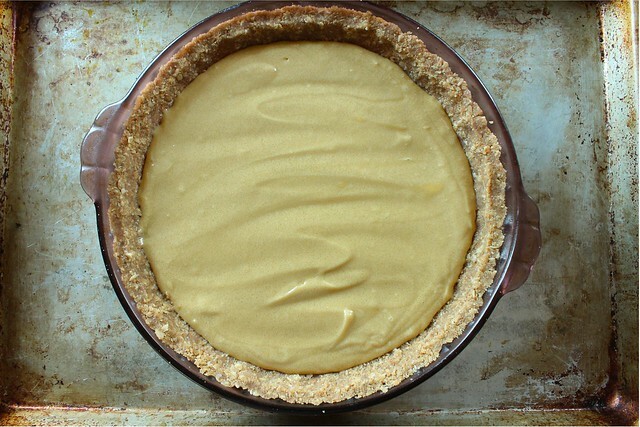 Begin the day before you'd like to eat the pie, as it needs to chill thoroughly to be at its best. I found that it was also a "good keeper", and pieces from the 4th and 5th day after baking were just as delicious as those the day after. Position rack in center of oven and preheat to moderate 350°F. Line a sheet pan with parchment (baking) paper. Lightly spray or butter a 9 inch diameter glass or ceramic pie dish, and set aside. Combine 6 tablespoons (85 gm) of the softened butter, 4 tablespoons (50 gm) of the brown sugar and the white sugar in medium bowl. Using an electric mixer, beat until light and fluffy, about 2 minutes. Add egg and beat until pale and fluffy, about 1 minute. Add oats, flour, baking powder, baking soda, and salt and beat until well blended, about 1 minute. Dump oat mixture into prepared baking sheet and press out evenly into a large, flat cookie shape. Bake until light golden, 18 minutes. Transfer baking pan to wire rack and cool cookie completely, about an hour. Using your fingertips, (or a food processor as I did,) crumble the cookie a into large bowl - there should be no identifiable pieces of cookie remaining. Add the remaining 3 tablespoons (45 gm) butter and 1-1/2 tablespoons (20 gm) brown sugar. Rub in with your fingertips until the mixture is moist and sticks together when pressed between your fingers. Whisk both sugars, milk powder, and salt together in a medium bowl, then add melted butter and whisk until blended. Add cream, then egg yolks and vanilla and whisk again until well blended. Cool pie completely in pie dish on wire rack. Chill uncovered overnight. Before serving, sift powdered sugar lightly over top of pie. 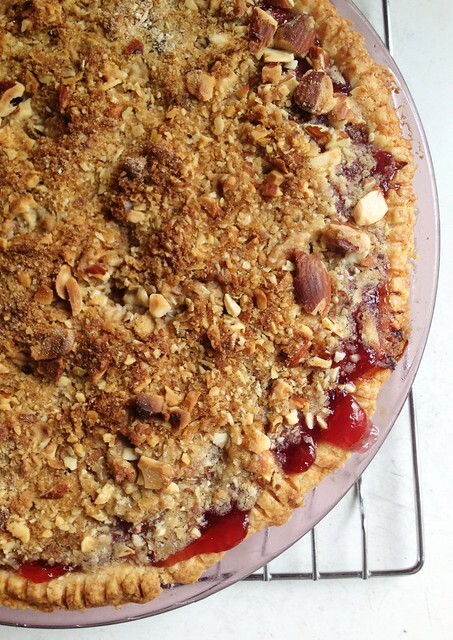 Cut pie into thin wedges (or as thin as you can manage after you taste it) and serve cold. I'm not sure I have a favorite type of pie, but after tasting this one, I could think of nothing else. 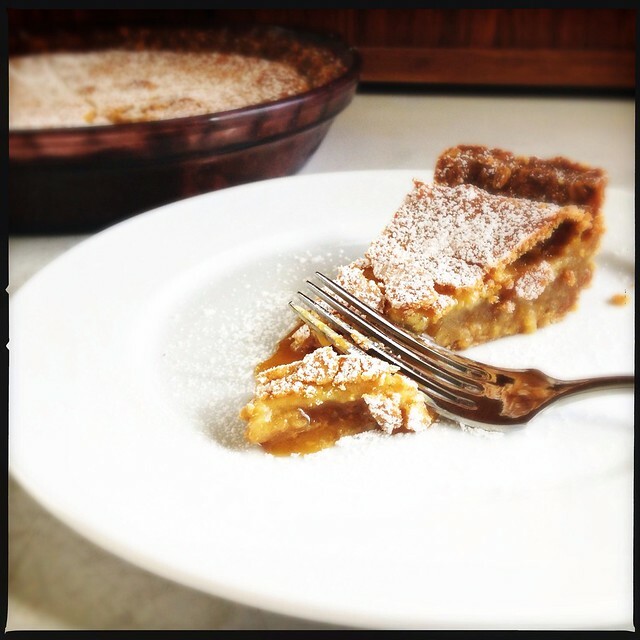 Even though I'm not as motivated in the kitchen lately, I have witnessed the return of my severe sweet tooth - and I have all kinds of pie recipes bookmarked that need to be made, or that I've convinced myself need to be made. click the photo for recipe. This was the cherry pie I made earlier in the month. It turned out to be an excellent pie as well, and easy because I used some home-canned cherries that I had been hoarding. I don't see a reason (except for perhaps lack of sleep) that I won't get to bake at least one pie next month - so stay tuned. This may turn out to be the summer of pie. After all, if I continue to reward myself with homemade sweets made with less sweetener, how bad can that be? Meanwhile, the Daring Bakers will have a lot of pies to peruse. Be sure to check out the blogroll and the recipes for this month's challenge. See you all on the other side of a new baby!